So I'm sitting here in my Tickler Ukulele T-Shirt checking the electronic mail and behold! a note from Amy Crehore announcing the unveiling of her second art ukulele. 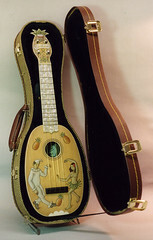 "Tickler Number Two is a pineapple-shaped uke with a special pineapple-shaped headstock. The painting on the front is of a pierrot and a native girl dancing a pineapple dance. The headstock has a painted pineapple pattern with a monkey's head and the "Crehore" name. "Built from scratch by a luthier (Lou Reimuller, creator of the Teenar!) and designed and painted by Amy Crehore, Tickler Ukulele Number Two has beautiful ivoroid binding around all sides, neck and headstock. The top is spruce, the back and sides are (flame) mahogany. The neck is carved walnut. The wood has been aged to perfection for over 30 years."